With the advent of online shopping this Christmas sale moved back even further and for the past few years has pretty much started on Christmas day, which even more recently turned in to starting as soon as the last shipment deadlines had past, Christmas Eve! Regardless of the history of the Christmas Sale, online bargain hunting is now one of the yearly traditions that many of us partake in. There are some great bargains to be had on everything from holidays to items for the kitchen, from clothes to televisions. So whatever you’re after and whatever you’re planning on spending your money on there are a few handy hints to make sure you don’t get fleeced out of your well deserved spending money. Below I’ve highlighted three handy hints to remember when bargain hunting, remember, for all the legitimate shops online, there are one or two nasty ones out there so before you get instantly sold on the bargain price, remember to take a few minutes to consider where you’re buying from. When entering any personal details, be it your address, login and password and most definitely your payment information such as your credit or debit card, it is essential that you enter them on a secure site only. Secure sites use something known as HTTPS and it differs from the standard web standard which is HTTP. HTTPS ensures that your details are encrypted within your web browser, then transmitted to the store you’re shopping on before being decrypted at some stage at the other end. This protects you from anyone intercepting your details as your details are secure due to encryption. There are a number of ways you can make sure that the site you’re using is operating using HTTPS. The best way visually is to look for the padlock symbol on the browser you use. On Internet Explorer 11 the padlock can be seen at the end of the address bar on the right hand side. On Google Chrome the padlock is to the left of the address bar in green with https also highlighted in green. If you don’t see the padlock then your information is unlikely to be secure. Buyer beware! HTTPS will make shopping safely online a guarantee. If you’re buying from a well known respectable brand such as Amazon or other big retailers then you can pretty much guarantee you know who they are. They’re already well known, reputable and you’re likely to have bought from them in the past or know someone else who has, nothing to worry about generally. However there are some smaller retailers who sometimes come up trumps with prices and have bargain offers. Many people are put off buying from sites they’ve never heard of and rightly so. Although by doing this you can sometimes miss out on a great deal and miss out supporting a small business. So one of the best ways to research the site you’re buying from is by doing a bit of checking on who registered the domain and how long it has been registered. A domain is the name of the site that you type in to the address bar, eg; “VPNCompare.co.uk”. As part of the regulations in the UK, any company that trades to the public should have their physical address details published in the public record of the UK registrar database. You can check any UK domain at the Nominet WHOIS tool. All you do is enter the domain and press Look Up. 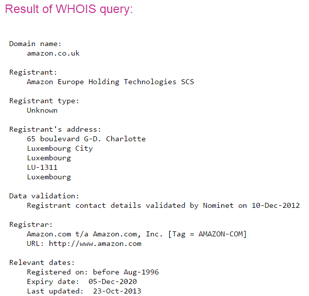 For example entering “Amazon.co.uk” brings up the Registrant’s address and the date the domain was registered. Why this is somewhat important is it allows you to see the physical location the domain was registered and if the site has opted to hide this information then you need to question why. While domains can be bought and sold looking how old it is can give you further peace of mind. If you see that a site has been very recently registered within the last few days or weeks then alarm bells should start to ring. Although it is possible for a new business to register a domain very recently, in most cases, sites popup, scam buyers and then vanish as quickly as they’ve arrived. Domains that end in .com or .net plus others can be checked in a similar manner at NetworkSolutions WHOIS although there are no similar requirements like .co.uk domains for trading companies to display their address. You can still see how old the domain is though! Knowing who you’re buying from is a great way to shop safe online at any time including the sales period. Contrary to popular belief, connecting to any public wi-fi system opens you up to possible privacy breaches. If you happen to connect to a public wi-fi network that someone up to no good is also connected to then you face the possibility of having your social media accounts accessed and possibly even worse. It’s rather simple for anyone on the same network to login to your Facebook account using a freely available tool. The possibility for much worse to be possible and more of your details to be stolen exists. So if you’re out and about or just connecting to a public wi-fi network for whatever reason then shopping online could open you up to the possibility of a privacy breach or even worse, financial loss. The way to safeguard your shopping using public wi-fi is to sign up for a product known as a Virtual Private Network, or VPN for short. A VPN will encrypt all of your network use, this means that websites you visit, emails you read or send will all be encrypted. 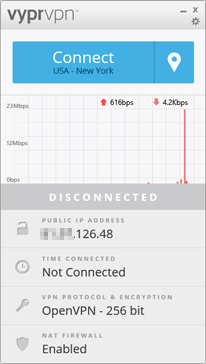 It is similar to HTTPS but on a much greater scale giving you peace of mind that none of your access will be visible to anyone on the same public wi-fi network as you nor to anyone in between trying to read your connection details. VPN providers charge between £3-£6 per month (US$5-$10) which for the peace of mind they give you is actually really good value. At around 10p or 16 cents per day, where else can you get something that stops your data being accessed and keeps nasty hackers at bay? There are a wide range of providers, you can compare them using our VPN Comparison Guide or take time to read through our extensive VPN Review section. They sound a lot more complicated than they are but are actually incredibly easy to use on your desktop, laptop, tablet or mobile and the good providers offer easy set up guides so anyone, even technophobes can take advantage. A VPN will definitely help you shop safe online for the sales.